"Oh, look! That's the third 'trail magic' I've seen today!" Then, upon closer inspection, I recognized our blue plastic bucket full of ice-cold soft drinks and a bunch of our "Runtrails & Co." cards - and realized that Jim put out the goodies for today's thru-hikers! I shouldn't have been surprised. He did the same thing when he was able to get a campsite in Shenandoah National Park that was only about twenty feet off the Trail. This time we're about 200 feet away, but Jim put the trail magic just inside the woods where the AT joins one of the paved roads through the campground of Gifford Woods State Park for a quarter of a mile. Jim wished he'd thought to get items at the grocery so he could grill hamburgers for the hikers. Maybe next time, if we're ever camped close to the trail again. Seventeen hikers signed the little notebook Jim left at the site. I know several of them and hope to catch up with them further up the Trail. I'm in the process of catching up the second time to many of the hikers I first saw in Virginia, W. Virginia, and Maryland, and others I haven't had a chance to meet yet, like "Longhaul," with whom I corresponded before beginning my journey. By the time I crossed US 4 near Sherburne Pass later this afternoon, there were about twenty names of thru-hikers with today's date in a register there. I hardly saw any hikers today until I was coming down from Killington Peak, twelve miles into my run. That's when I met "Snowman" for the first time. Oh, there was the hiker-wannabe sitting stoned or drunk in the Governor Clement shelter at mile eight, who asked me in a slurred voice, "Are you hikin' or somethin'?" He doesn't count. There are so many problems with "non-hikers" at this location that the ATC cautions hikers to not stay there overnight. I didn't even stick around to sign the register! And there were a few AT and Long Trail section and day hikers along the way, mostly near Sherburne Pass, Killington, and Gifford Woods SP. I exchanged pleasantries with those folks. The first time "Snowman" went trucking by, he commented that he'd be mighty glad when he got off Killington/Pico mountains so he'd be rid of all the tangled pine tree roots in the Trail. I laughed and said we'd probably find some more on the next mountain range. He caught up to me a second time after taking a break at Pico Camp. This time we hiked together for a few minutes and I was able to get some information about him. Snowman is a young man from South Wales, here for seven months for his AT thru-hike. He hasn't hiked much before in the British Isles because "the trails go through too many villages." He liked the idea of hiking for months through mostly wilderness and has thoroughly enjoyed his time here in the U.S. He's averaging about fifteen miles a day now and should finish at least a week before his plane flight home in early October. His name was bestowed upon him by fellow hikers a few days into his trek when he built a little snowman - complete with backpack - on Blood Mountain (Georgia) back in March during a snowstorm. "I built a few more after that, too," he said, meaning there were more snowfalls. I've seen his name, comments, and little snowman drawings in trail registers along the way. I enjoyed meeting him and listening to his delightful accent. 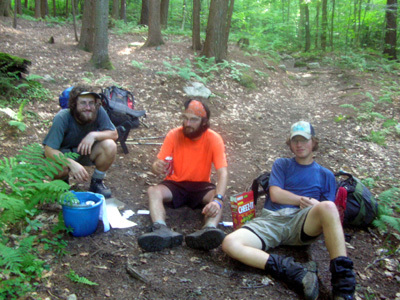 I met four other thru-hikers sitting on a log at Maine Junction later in the afternoon. This is the point where the Long Trail and Appalachian Trail separate. The LT continues north to the Canadian border and the AT turns east toward New Hampshire. I talked with "No Show," "Adam," "Chuck," (not their real names), and "Chubster" about twenty minutes. The first two have been hiking together, as have the last two - but the two pairs haven't seen each other for a couple months, until today. They were having fun comparing notes about life on the Trail and they seemed interested in "my way" of running/hiking the Trail. In fact, Chubster has met David Horton and was very interested to learn that he recently set a new speed record on the PCT. The guys were all intrigued by Traildog's new AT record, too, marveling how anyone could cover so many difficult AT miles so fast. I took the photo of No Show, Adam, and Chuck about half an hour later. They got to the park just behind Jim and the dogs and me. I don't know what happened to Chubster in those last two miles . . . There was an empty cooler and plastic box at Upper Cold Creek Road a little later on, courtesy of "The Mad Hatter." 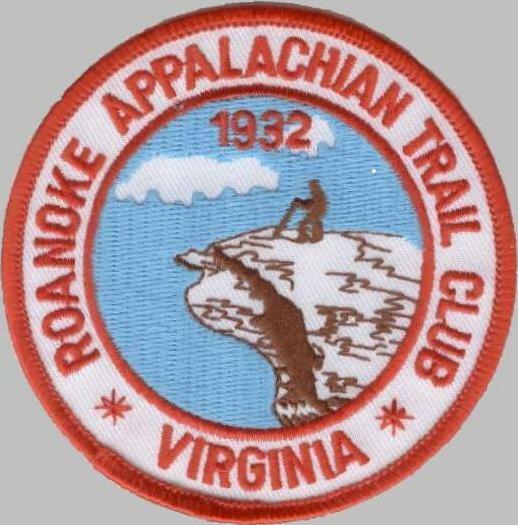 I've been thinking recently that many SOBO thru-hikers won't be getting to the Roanoke area until after we are back home. I'd like to keep a cooler of goodies for those folks at one of the road crossings closest to our home, as pay-back (pay forward?) for all the trail magic I've seen on my run. 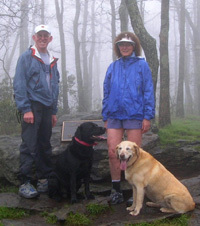 Many trail angels are former thru-hikers or section hikers who know how much the surprises mean to hungry backpackers. I usually don't take anything, preferring to leave it to backpackers who don't have the selection of food to which I have access every day. OK, HOW WAS YOUR RUN TODAY, SUE??? Oh, yeah. I almost forgot about a description of today's section! 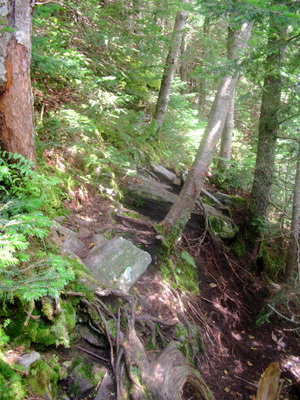 It was typical Vermont trail - some very soft and runnable, some so gnarly with twisted pine roots and mossy rocks that I had to slow 'way down to avoid falling, almost all of it shaded and beautiful, through several eco-zones up and down Killington Peak and Pico Mountain (mixed hardwoods morphing to birch trees and ferns morphing to dry pines morphing to wet sub-alpine spruce - and back down again). There were few views because I was too lazy to climb another 2/10ths of a mile straight UP Killington, off the AT. I rationalized that the view couldn't be any better than what I saw from Baker Peak yesterday . . .
A long relocation done in the late 1990s on Killington and Pico added over three miles to the Trail on Killington/Pico mountains and routed it well enough below the peaks to completely avoid any sight or sound of the ski business above. In fact, the Trail doesn't even cross any of the ski runs like on Bromley. I got a kick out of the privy on Killington, near the Cooper Lodge, a little hut for hikers. 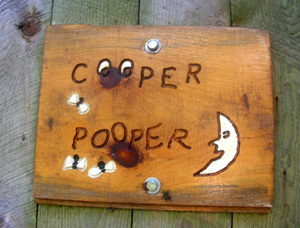 The privy has a painted wood sign reading, "Cooper Pooper" and a hand-written sign requesting that everyone pee in the woods first, as the privy can't handle urine. It's an eco-thing, I guess, because of the delicate balance of nature in the sub-alpine zone (here, at 3,850 feet). Speaking of heights, that was today's highest elevation. The lowest was 860 feet at the start. Do the math. Long climb! And there were the inevitable climbs and descents in between, for a total gain of about 5,000 feet today and 4,200 feet loss. And to think, I considered this an easy day because it was "only" twenty miles! Some of the climbs in this section are steep but the long one up Killington from the south was pretty gradual. What made it difficult in some parts was the rooty, rocky treadway. The Trail was vastly better in all the relocations today, including a beautifully-runnable two miles down Pico to busy Hwy. 4. Several of the shorter descents were steep, also. I wouldn't call this twenty-mile section real runnable. It would be easier done north to south, with a net elevation loss. Some of the newer sections are great, but there are still enough rocks and roots on the old sections to slow down even the fastest runner. There were several creeks again today but not nearly as many as yesterday. No ponds. Several cairns - I always smile when I see those. Today's run of "only" 20.7 miles was more relaxed than yesterday's longer session. I felt no pressure to be done at a certain time, since I was finishing in our campground and Jim didn't have to drive to a trail head to retrieve me. I carried much less water and gel - and didn't use up either. My pack felt so much lighter (because it was). I have totally forgotten the luxury of running with NO pack. With my lighter pack today I felt the same way backpackers do when they occasionally "slack" a section with only a day pack. Freedom hiking, they call it. So I surprised him by calling the dogs. They always come speeding up the Trail to greet me. Jim stayed at his mossy perch on a little knoll and waited till I got to him. The Trail back to camp was full of mossy rocks and roots, which he dislikes. Shows how much he loves me to come out again to meet me when the Trail is less than ideal! Thanks, honey. A word about Gifford Woods State Park - pretty place with reasonable fees, although there are no hook-ups. Inside the 285-acre park is a 12-acre virgin stand of old-growth hardwoods with many grand-sized trees, including Vermont's state tree, the sugar maple, left in their natural state. Somewhere else in the park is a 400-year-old hemlock tree. The park is also a major migratory route for birds, attracting birders in the spring and fall. The AT runs through the park and crosses VT 100 to nearby Kent Pond. That's where I'll begin my next section on Friday. 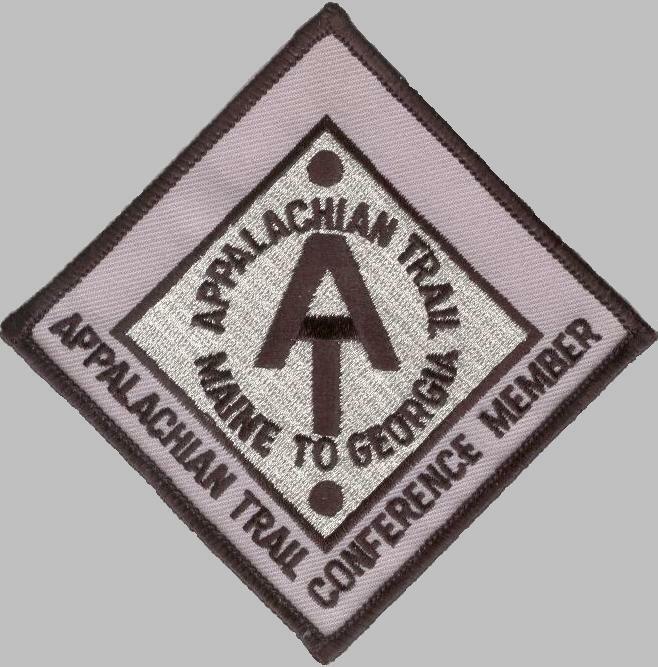 Tomorrow morning we'll be heading for the same campground in Quechee where we stayed a week for the VT 100 race a month ago. (Has it been that long??) I am taking tomorrow off for three important appointments - massage, chiropractic adjustment, and a perm (my hair is totally out of control). One of us will write something tomorrow.